Ahlgrim Family Funeral Services has been a mainstay in the Lake Zurich and Palatine business communities for many years. Started in 1892 as Ahlgrim Undertakers in Chicago and eventually becoming Ahlgrim Family Funeral Services. The family has a proud heritage of outstanding service to families in need and a legacy of commitment to Lake Zurich and Palatine. 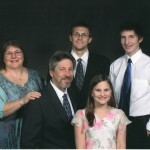 Douglas and Sandra Ahlgrim and their three children, David, Richie and Lucy, moved to Lake Zurich in 1986. Doug is a fourth generation funeral director and his father Roger Ahlgrim, assists in an advisory capacity. Roger resides at the Palatine funeral home where he helps with services on occasion. Doug and Sandra moved to Lake Zurich from Palatine, appreciating the warmth and small-town atmosphere as a great place to raise their children. Both Doug & Sandy grew up in Palatine and wanted a similar lifestyle for their family. Lake Zurich was a good fit since it truly became home as their sons, David and Richie, currently in High School, are both scouts in Troop 964 sponsored by the American Legion Post 964, and their daughter, Lucy, is attending 2nd grade. They are members of St. Peter United Church of Christ. On the professional side, the funeral business is constantly changing. Personal preferences, the technology available to create meaningful services, changes in the law and consumer advocacy are all areas in which the Ahlgrim’s strive to stay at the forefront and maintain the highest of standards. Douglas is a member of the National Funeral Directors Association, Illinois Funeral Directors Association as well as the Funeral Directors Service Association of Greater Chicago. He is a Past President of the Lake Zurich Rotary Club and a Worshipful Past Master of Lake Zurich Masonic Lodge. The firm is a member of both Lake Zurich and Palatine Chamber of Commerce. He has taken an active role in advocating for consumer protections and professional standards and ethics in this profession. He feels very strongly about having the opportunity to meet with people at one of the most difficult times of their life, making the process of a funeral one that is compassionate, caring and as easy as possible for the family members involved. Recognizing that each family situation is unique and needs differ greatly, it is a privilege to help each one in the plan that fits them best. The funeral homes in Lake Zurich and Palatine are comfortable places to be, not only when you are making arrangements, but for visitation and services as well. During visitation there is ample room in a home-style setting for you and your family to visit and greet your guests. We have the ability to comfortably view tribute films and have groupings and conversations in different areas of the home. We want you to be comfortable at a time when it is important to feel at home. The entire staff is committed to meeting your needs. No matter the type or complexity of the service you choose, our goal is to care for each and every detail as we would for one of our own family members. This means being aware of traditions, as well as making way for new and more personalized options. For example, the trend toward cremation has become prevalent in our area. Ahlgrim Family Funeral Homes offer a complete array of services for cremation along with many options to memorialize and provide keepsakes. The ability to provide keepsake urns, remembrance jewelry, that holds cremated remains or a lock of hair, as well as a way to capture a fingerprint and turn it into a treasured pendant, are only a few of the options available at Ahlgrim’s. The only way to find out for sure what services fit your needs is to talk to a trusted funeral professional. As a licensed director for more than 23 years, Doug has the experience, ability and knowledge to help you develop the plan that best suits your needs. You are invited to stop in and talk it over. You’ll be pleasantly surprised at how much is available for every situation from your hometown staff at Ahlgrim Family Funeral Home in Lake Zurich and Palatine.